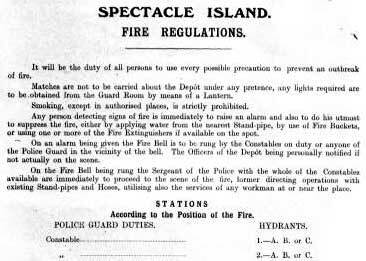 Thanks to Robert Curran, Drummoyne NSW, for his compilaiton "Spectacle Island History." Sunday 3 (February 1788) PM ... As we proceeded up the Harbour, the natives all fled in their canoes as fast as they could. About 4 miles higher than where the Ships lay, the country was open & improved the further we went up & in most places not any underwood, Grass very long. Monday 4th PM Follow'd many openings to the NW & passed a narrow channel into a wide space which could not be in our power to survey before night & there being assembled up here an astonishing number of the Natives all arm'd, Flats on which the Boats might ground in this channel & put us much in their power, not having any people but the Boats Crew with us & being 8 miles from the ship, Captain Hunter thought that taking the necessary precautions would employ too many of our people for us to go on with the plan we were prosecuting; we therefore returned & moored the Boats for the night at Dawes Island. AM Went into the SW Branch found it terminated in snug coves, surrounded with Mangroves, rather shoal water. 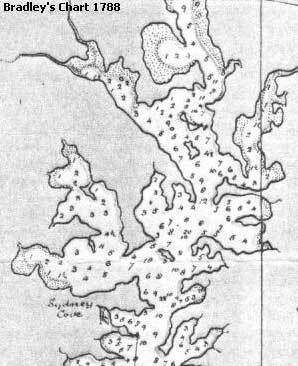 Bradley also mapped Spectacle Island in his chart of Port Jackson. The Island is the "spectacle-shaped" island about one-third of the way from the top in the chart extract below. Spectacle Island in the foreground, Cockatoo island behind it. The Colonial Powder Magazine at Spectacle Island. During the early days of the colony of New South Wales the Naval Ordnance and powder came, as was the case in Great Britain, under the control of the Master General of the Ordnance through the Board of Ordnance which existed between 1597 and 1855. The Master General of the Ordnance had both a military role, as commander of the Artillery and the Engineers, and a civil role, as head of the Ordnance Department. In 1855 the responsibility for the administration of ordnance passed to the Secretary of State for War by royal decree "revoking the letters patent of the Master General, Lieutenant-General and Principal Storekeeper of the Ordnance". Until 1836 there was no branch of the Ordnance Department in New South Wales; the Commissary kept a separate account of Ordnance stores received, issued and remaining. On 1 January 1836 the Royal Engineer and Ordnance Storekeeper, who had arrived from Britain late in 1835, commenced duties. In 1837 the Colonial Stores were placed under Ordnance Superintendence and on 1 January 1839 the Ordnance Storekeeper took charge of the Colonial Store Department. On 1 January 1845 the Colonial Storekeeper's Department was separated from Ordnance control because of the expansion in Colonial business. In 1870 the Ordnance Storekeeper's Department was abolished with the withdrawal of Imperial forces from the Colony. The situation therefore was that up to 1870, the Naval Ordnance and powder on shore had been under the control of either the Commissary or the Military (the Ordnance Storekeeper). The withdrawal of the Imperial troops in 1870 forced the Navy to appoint a paymaster to take charge of the naval and victualling stores and a first class gunner to take charge of the ordnance stores. I beg leave to acquaint you, that the consignment of Merchant Gunpowder 749 Barrels received per Ship "Calabar" have been stored in the passages of the Magazines, the whole of the Racks and Bays being quite full. - The Passages of the Large Magazine are full, as are also the Passages of Nos 1 and 3 Colonial Magazines - No. 1 almost crammed. Should another consignment of Gunpowder arrive shortly there is no space for storage in the Magazines. Spectacle Island had been canvassed as a site for a magazine as early as 1848, although in early 1862 a site at the rear of Victoria Barracks was also being considered. The latter site was dismissed by Percival Wilkinson, the Assistant Military Storekeeper, because of "the inconvenience of such considerable land conveyance of large quantities of Ammunition and the ground being low and damp". By May 1862 the Colonial Architect had finalised and costed a plan of works for the magazine, based on advice from the Brigade Major and the Assistant Superintendent of Stores. The estimated cost of the works comprising a "Gunpowder Magazine with Guard House and other necessary buildings" was 7,000 pounds; this was placed on the estimates for 1863 and was approved by 23 January 1863 when the Colonial Architect was requested to carry out the works. Tenders were called for the work; the highest tender being for 11,350 pounds and the lowest for 6,430 pounds. The successful tenderer was Mr. John Gwynneth who tendered 7,439 pounds. The contract for the work was issued about 26 August 1863. Mr. Gwynneth went bankrupt with the work only partially completed and despite a request from the Official Assignee that the contact not be re-tendered, this course of action was taken and a contract for completion was let to Mr. William Thornton on 21 November 1864 for the sum of 4,450 pounds. Contracts were let in 1865 to equip the new magazine; items provided included furniture, powder wagons and magazine trucks. The buildings of the new magazine were completed by about the 20th of September, 1865. I have the honour to report for the information of the Honourable the Treasurer that the white ant has made its appearance in one of the magazines at Spectacle Island. The ravages of the "white ant" (termites) figure prominently in the periodic maintenance requests in the files of the Colonial Architect. In 1871 a tender was accepted for the erection of cottages on the Island; these were in addition to the Foreman's quarters originally provided. These cottages were evidently located hard by the magazine and by 1876 were being regarded, probably as a result of the recommendations of the 1875 Storage of Gunpowder Board, as a safety hazard. In the additional estimates for 1876 the sum of 800 pounds was voted for the erection of two replacement cottages (to the 1871 specification). 350 pounds was also voted for the extension of the wharf, this work being necessary as due to a miscalculation when first constructed, lighters could not be brought alongside at low water. The two cottages were under construction in March 1877 when a requisition was submitted for the construction of a new laboratory. Stone for the cottages was being quarried on the island, and the site proposed for the laboratory was where the quarrying was being done. It is apparent that at this time the island comprised two parts connected only by a narrow isthmus possibly under water at high tide, as the construction of a road to connect the two islands was proposed using the stone "ballast" from the quarrying operation. The laboratory, a boatshed and a new "temporary" magazine all appear to have been completed about 1878. About this time negotiations were proceeding between the Commodore in Charge of the Australia Station, on behalf of the Admiralty, and the Colonial Government for the provision of naval facilities on the station. The Government wanted to shift the powder from Goat Island due to the danger to the population of Sydney and, because the new flagship, HMS Nelson, required extensive warlike stores, it was suggested that Spectacle Island was a suitable site for their storage. Also of concern was the powder and guns for arming merchant ships as cruisers in wartime. an additional room for the gunner's quarters..
erection of a 5 ton crane on the existing wharf. erection of a new wharf at the south end, to be fitted with a 20 ton crane for lifting guns and a 20 cwt mobile crane. an ordnance store for merchant ship's equipment. a torpedo and gun cotton store. rearrangement of racks and fittings in the powder magazine to suit Admiralty pattern barrels. additional water supply and drainage. These works were progressively completed during 1884 and 1885. Early Buildings on Spectacle Island. The following list was compiled in 1902 (The National Trust of Australia (NSW) letter of 4th September 1972) and shows the date of erection of each building present at that time. It also shows those buildings that were in the course of erection or which were then proposed. It serves to identify the early stages of the island's development. New Laboratory Awning over Tramway Paint Store in portion of Cable Tank Tramway from Laboratory to Quick Firing Ammunition Store. Henry Capper. Gunner Royal Navy, one of the early characters associated with Spectacle Island. Henry Douglas Capper, Gunner RN, was appointed as Officer-In-Charge of the Naval Ordnance Depot, Spectacle Island in 1894, following on from Henry Bennett. He was to serve in the post until 1900. We regret to announce the death, as the result of a road accident near Faversham, of Lieut. Comdr Henry Douglas Capper, a pioneer reformer on behalf of the warrant officers and men of the Royal Navy. He was 76 years of age. It was largely due to his reasoned advocacy that promotion from the ranks and other concessions for the amelioration of the conditions of service were granted, and he was the recognized leader of the movement from 1882 until his retirement in 1910. Later Commander Capper was a prominent official successively of Miss Agnes Weston's Sailors Rests, the British Sailor's Society, (with which he served as liaison officer from the Admiralty during the last two years of the late War) and, finally, of the sea training work connected with Dr. Barnardo's Homes. For many years he had been a prolific writer to Service and other periodicals, and his nom-de-plume, "The Man behind the Gun", was familiar to a large public. The son of a dockyard official, Lieut. Comdr Capper was born at Portsmouth in April 1855, and several of his kinsmen were in the Navy. His first recollection of men-of-warsmen was as a child clinging in terror to his mother's skirts as a crowd of seamen, just paid off after a long foreign commission, were holding a posse of police at bay in the street in which he lived.In a book of reminiscences, published in 1927, he depicted the transformation from such scenes of rowdiness and disorder to the conditions of today, which have made of the fleetmen, a body of educated, self - respecting men of whom the nation may be justly proud. Young Capper, at the age of 10, when his father died, was taken by the Master Shipwright into his office as a messenger. He served for four years in the yard until an official from London who came across him one day ordered his discharge for being under age. In 1869 he entered the Navy as a boy in the St Vincent at Portsmouth. After serving in the Dryad in the West Indies, and other ships, he was promoted to warrant rank acting gunner in November 1879. Four years later he acquitted himself with credit when in command of the gunboat Esk at Hong Kong during a heavy typhoon. He afterwards became a gunner of the Canada, a corvette, in which King George had served as a lieutenant, and while in her he originated and for the first two years served as honorary secretary of the United Service Warrant Officer's Club at Bermuda. It was while he was in Canada that Capper was first recommended for a commission, but nothing came of it. 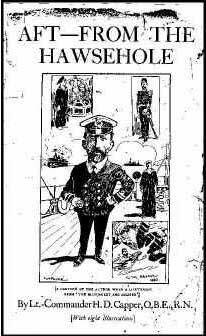 In the early nineties he was appointed to the Admiralty for duty in the newly formed Naval Ordnance Store Department, and about this time began the publication of a monthly magazine for naval warrant officers, entitled THE GAZETTE, afterwards renamed the NAVAL WARRANT OFFICER'S JOURNAL. For seven years he was the editor and manager of this publication and adopted for it the motto "Educate and Advance". He drew up and signed the first "Earnest Appeal for Promotion from the Ranks in the Royal Navy" and gave evidence on behalf of the warrant officers before various committees. Most of his evenings at this time were spent in "lobbying" in the House of Commons, and he obtained the confidence and support of naval officers like Admirals Richard Mayne and Edward Field, as well as civilian members like Mr Thomas Gibson Bowles and Mr. H.O. Arnold-Foster. The various concessions which resulted from this advocacy are described in his book, "Aft from the Hawsehole". He records therein that in 1895 he was seen one day by the Director of Naval Ordnance in conference with Mr. John Burns and another member of Parliament in the inner lobby. Next morning the DNO sent for him and said he objected to political wirepullers in his Department and would send him to sea. Eventually he chose the post of officer-in-charge of ordnance stores in Sydney. It was not until 1902, when Lord Fisher, under whom Capper had served, was Second Sea Lord that a hundred commissions as lieutenant were granted to warrant officers, among whom was Capper, Capper afterwards served in HMS CLYDE drill ship at Aberdeen. On the outbreak of the late War, he returned to active service, and was appointed to organise the Anti-Aircraft Corps at Dover. His services over many years on behalf of his brother officers were appreciated very highly, and he was on more than one occasion the recipient of presentations in recognition of his great zeal and unflagging industry. He was made OBE for his services during the war. Comdr Capper was married, and one of his sons, Sub Lieutenant S.V.P. Capper, is now at Keyham Engineering College. One of his daughters was with him at the time of the accident in which he lost his life." His appointment to the post of Naval Ordnance Officer at Sydney, is the cause of the Association losing for a time the advantage of his active assistance...He has gone to his new post accompanied by the good wishes of all who have been associated with him, either in the work of the Association or of the Service, and whether he be in England or at the antipodes, we may be sure he may be depended on to fully uphold the credit and advance the cause of the Naval Warrant Officers..."
Even in retirement Capper's restless energies could not be contained and at the outbreak of World War 1, though over age, he volunteered for service and was sent to Dover where he raised and commanded an Anti-Aircraft Corps until the duties were taken over by the military. The Corps was the first in England to illuminate a Zeppelin with a searchlight and when the first bomb dropped on England, the Corps secured pieces of it. Capper personally presented a fragment to the King. (Compiled from information provided by Capper's granddaughter, Mrs. C. Ratter). Naval Heritage Centre and Museum on Garden Island. This $5 million project now opened to the public and accessed by Sydney Ferries from Circular Quay will now display many of the 500,000 items that were stored at Spectacle Island. At that venue they were locked away from the public at large, and no comprehension of the vast heritage of the Royal Australian Navy accumulated over the years was previously possible. which lies on the Parramatta River east of Drummoyne. The centre, at the northern end of Garden Island, Sydney, consists of two converted heritage-listed buildings, the former gunmounting workshop (Building 7/8) and the boatshed (Building 25). An area between the two buildings was landscaped for large external displays. The development includes a café and conference facilities. Two highlights in the main building will be the conning tower from one of the three Japanese midget submarines which attacked Sydney on May 31-June 1, 1942, and the boom boat which was dispatched to check a report of “a submarine caught in the boom net” that night. At long last the value of our Naval Heritage has been accepted both by the Federal Government and in the higher echelons of the RAN, but it has been a very long time coming to fruition. 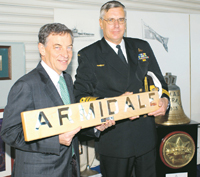 Defence Minister Senator Robert Hill presents an Armidale name board to Chief of Navy Vice Admiral Ritchie at the launch of the Naval Heritage Centre on Garden Island. Launch of Naval Heritage Centre. Well I wanted to say with Admiral Ritchie, that establishing a Navy Heritage collection on Garden Island, which will be available to the Australian people and to visitors to Australia for generations to come, I think is a wonderful thing. The Royal Australian Navy has such a rich and proud heritage, but its great collection is dispersed across the country and there’s very little public access to it. What we will now be doing is providing public access to it, enabling visitors to understand a little more about the people of the Navy, the generations of people of the Navy that have given such wonderful service to our country. 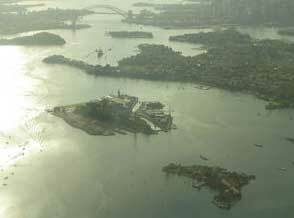 Navy Heritage Centre Opens on Sydney Harbour. An extraordinary collection of Navy Heritage was revealed today by the Chief of Navy, Vice Admiral Russ Shalders at the opening of the Royal Australian Navy Heritage Centre on the shores of Sydney Harbour. A selection of artefacts showcasing a century of Australia’s Naval heritage is displayed in the Centre which is located in the Public Area at the northern end of Garden Island. Exhibits from Navy’s heritage collection of 250,000 items will be rotated through the Heritage Centre. Vice Admiral Shalders said the RAN Heritage Centre is an institution of national significance dedicated to all those who have served, are serving and will serve in Australia's Navy. “The Centre aims to inform and educate the public on our Navy’s history through more than 100 years of peace and war,” VADM Shalders said. The RAN Heritage Centre is highly interactive. Visitors will see an extensive range of artefacts from ships and battles including those from Colonial Navies. Visitors can also stand on a simulated open bridge of a World War II destroyer, get a submariner's view of Sydney Harbour through a fully operational attack periscope and inspect the conning tower of one of the Japanese midget submarines that attacked Sydney Harbour in World War II. Historic gardens and unparalleled views of Sydney Harbour will also be opened in the Public Area. The Public Area has a number of relics from Garden Island's past. It holds the earliest known graffiti in Australia (January 1788) from when Fredrick Meredith, a First Fleet sailor, carved his initials into a sandstone rock. Whilst surrounded by Navy's heritage, visitors can also enjoy a light meal, coffee or cold drink at the new Salthorse Café. The ex-Main Signal Building, which once controlled the movement of naval vessels in and out of the harbour, has had its roof converted to a viewing platform. Here visitors can enjoy a spectacular 360-degree view of Sydney Harbour. The RAN Heritage Centre opens to the public on Wednesday, 5 October 2005. The Centre will be open between 9.30am and 3.30pm daily and will operate seven days a week. The public will be able to travel by ferry from Circular Quay to Garden Island.